Creation of a Special Fund for giving Free Medical Relief to the Poor, including free eye operations. Based on the ideal of ancient India’s Gurukula tradition this purely residential institution for young girls imparts intensive training to them in the formative period of their lives, not only in the field of dhyana, japa , Yogic asanas , truthfulness, complete self-reliance and so on, but also in modern education, music (both vocal & instrumental), sewing, cooking etc. to make them the ideal women of this country in the future. Admission age Minimum five, maximum twelve years. Essential qualifications Must be of a good upbringing, bright, of a gentle nature and without any physical deformity, No orphans are admitted. Duration of stay in the institution Till the completion of minimum High School standard (Purva-Madhyama). General education From Primary level to M.A./Acharya of recognised universities, including doctorate degrees in Sanskrit or Hindi. Monthly expenses Rs 600/- per month per student covering all expenses. Seats are very limited. Session begins from July. Shree Shree Ma Anandamayi,(1896-1982) the unique embodiment of the spiritual; the Uncreated in peerless manifestation; the Divine Mother, full of love and compassion, come to uplift all humanity, torn asunder by hate, greed and violence. Millions of people of various castes, creeds and religions in India and many from distant parts of the world were blessed by the irresistible radiance of Ma’s personality, transforming their worldly suffering to Divine Bliss. All spiritual leaders of all religions recognised Shree Ma as the Divine Mother. There are 26 Ashrams all over the India in Shree Ma’s name, working for the welfare of the poor and down-trodden. The Bhopal Ashram is one of them where the School is running. SHRI SHRI MA ANANDMAYEE UPVAN SHIKSHA SAMITI. It is a registered charitable Society and has Income Tax Exemption Certificate 80G from Income Tax Department, and has a FCRA certificate from Govt of India to receive foreign funds. It was established on July 1998, with only 7 students. The school is recognized by the State Govt up to class 10. It is 10 km from Bhopal Station and 4 km from Bhopal airport. The School is based on Sri Ma’s teaching “JAN JANARDAN SEVA” (the service of God in the form of children).Near the School is a slum area with a population of about 20,000. The students come from the nearby slum area. There are 6 children in one family. The parents are labourers on daily wages who get employment for barely 15 days in a month. They have large families to support and they do not want to send their children to school but prefer to send them to earn to help the family. About 90% of their fathers are addicted to drink; some of the father’s have a criminal background and about 80% of parents are illiterate. Almost all the children belong to Scheduled Casts and Scheduled Tribes. Their Mother tongue is Hindi and medium of teaching is Hindi. A selection committee of five teachers including the Headmaster go personally to slum areas and persuade their parents to send their children to school. On the assurance that the school will provide free education and free books, photocopies, uniforms, midday meal etc, their parents agree to their admission. Some of the students are also working in the morning and come to school in the afternoon. Most of the children are rag-pickers. The School is running in a 3-storey building, whose area is 9,000 ft; it has 15 rooms (20 feet length and 15 width). The School is affiliated to the State Government up to class 10. Morning Shift : Nursery to K.G. 2nd -150 students (age 3 to 5 years). The total number of students in the current year is 550. Curriculum taught is according to State Government schools and the medium is Hindi. Apart from the curriculum the children are given counseling daily for their personal problems, special periods are given for their cleanliness, as they are living in slums. The teachers do not give them homework as both homework and classwork are done in the school with the help of the teacher – as they have no one to help them in their studies at home. Facilities provided by the school : Free uniforms, books, photocopies ,pen, pencil, midday meal, Sweaters in winter. Regular health check up etc. Our greatest achievement has been these children who were totally ignored by society. They had a 100% result in the exams and overall development, and 0% drop out rate. Since the establishment of the school we have educated 5000 slum children. There are 20 teachers and 10 non-teaching staff. Teachers are Graduates and post Graduates and are dedicated to the institution. The total Budget for the year 2015-16 is 30 lakhs. The cost of each student is Rs 5,000 per annum. We have very few donors. Therefore we face financial problems throughout the year. We are planning to upgrade the school to class 12. Due to lack of funds we are unable to provide education to a larger number of students. We require an expansion of the old building to provide a good standard of quality education. We hope that you all will give us all the necessary support and are looking forward to your early response. We are not getting any grant from the Government or any institution. An English Medium Residential School for Boys only. Affiliated to Council for the Indian School. Certificate Examination: New Delhi. A complex for the children from Standard 1 to XII. The School is situated at a picturesque site. Enviable hostel facilities in a calm pleasant and pollution free Vanasthali setting 2 km away from Haridwar-Rishikesh Road. It is designated to impart integrated education to children, drawing the best from Indian culture and traditions of the past, instructing and helping them to acquire knowledge in Humanities, Arts, Science and co-curricular activities. The campus was once Shree Shree Ma Anandamayi’s Agnatavas (Retreat) and now a Memorial School. Admission forms, Prospectus and other information can be had from the office. For video tour click here. 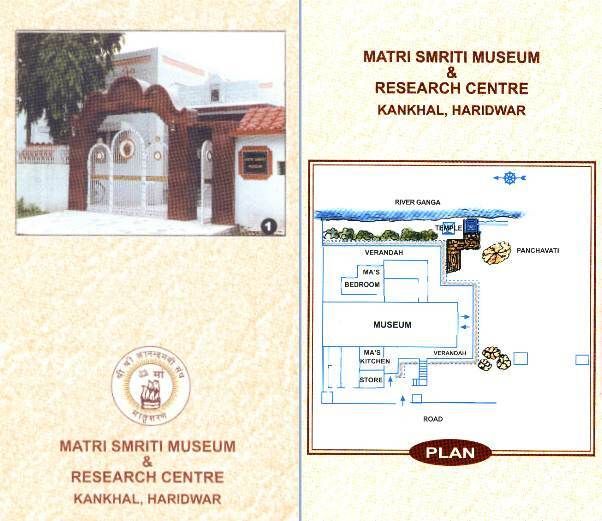 With a view to preserve for posterity the relics associated with Shri Shri Ma a museum has been established with donations from devotees at Ma Anandamayee Ashram, Kankhal, Haridwar. It is situated on the left bank of the road, in the bungalow located on the right bank of river Ganga (Kankhal branch) and this bungalow was specially built for Shri Ma’s use by Shri S.N. Ghosh & Smt. Ranu Ghosh who donated it to Shree Shree Ma Anandamayee Sangha. Before Shri Ma took Mahasamadhi she stayed here for about 2 months. The bedroom of Shri Shri Ma on one side and the kitchen on the other side is maintained as such with a hall now carved in the centre to exhibit clothes, corporeal relics of Shri Shri Ma, ritualistic objects, rare piece of paper in which Ma’s handwriting is preserved, certain handicrafts made by Shri Shri Ma including a carpet used by her during her pilgrimage to Kailash Mansarovar. The collection besides many items consists of a pair of Manjira which was used during ‘kirtans’ by Shri Shri Ma. The objects also includes some articles presented to Shri Shri Ma by her devotees. The clock which was kept in Shri Shri Ma’s room is also shown recording the time of Maha Samadhi on 27th August, 1982. The exhibited collection also contains a large number of paintings depicting her life’s journey from Kheora to Kankhal. Amongst photographs include portraits of her family. There are large number of photographs taken during her sadhana days in Shahbag etc. There are also photographs showing her different moods and association with contemporary Mahatmas and political leaders. The first floor of the building contains a large number of paintings of Ma’s life, a small auditorium and a Research centre. The library containing books on Shri Shri Ma and all religions is situated in the new block of the main Ashram premises.